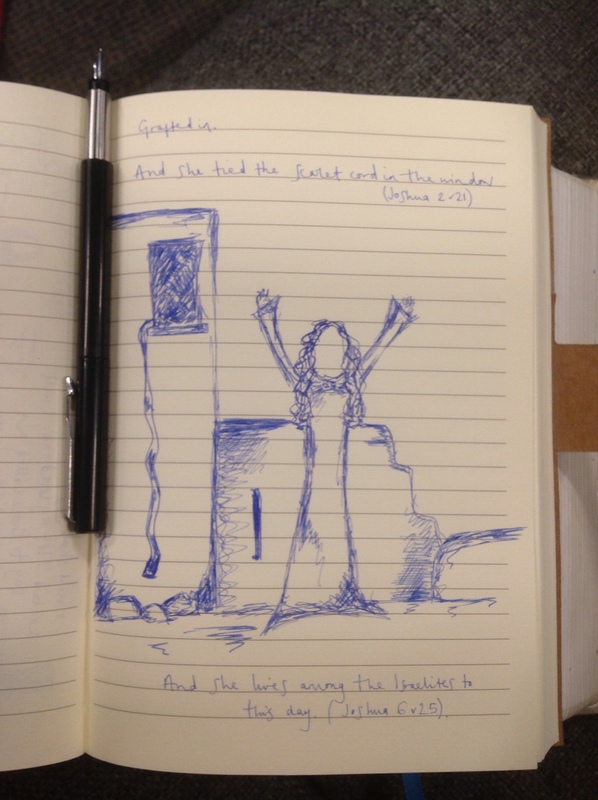 Rahab and learning to dance in the rain. Of my favourite bands right now, in my quiet-down-my-soul-time, are The Oh Hellos. They have this album called Through the Deep Dark Valley, and this song called I Have Made Mistakes, and I recommend both to you wholeheartedly. The opening lyrics to that song are stunning and raw and true. I think. And it will make you whole. Because oftentimes, it's the rain that strengthens us. It's coming through the deep, dark valley that grows us. It's in the surviving and striving and rising that we learn of God's beauty, and strength, and forgiveness and perseverance and love. Don't get me wrong. I love the sun. I think we were created to love the sun and rejoice in it and value those seasons of bright, piercing, present light. But it's just we grow in the rain. We are strengthened as we worship in the rain. As we meet Jesus and dance in the downpour. This life of faith is beautiful in its fullness. But yet also at times, so raw and undoing. It's filled with battles for breakthrough and understanding. It's filled with countless wilderness seasons where we just learn to lean a little more on Jesus. It's filled with wrestling and dealing-with-stuff and laying down our dreams. It's filled with seasons of balling our eyes out and pressing through to find that true joy is unshakable. Because in the rain we can often realise that only love remains. I've been a Christian for 3 decades and I still can't get my head around how much His heart burns with love for me. That I am the desire of His affections. That His mercy restores me in a deeper way that I could ever deserve or understand. That I bring Him joy. That He rejoices when I find my joy in Him. I've been reading Joshua, Judges and Ruth this last week. And when I keep hitting and thinking and reflecting on these men and women thatGod mercifully grafted into His plans and purposes I can only see again and again that in His ways redemption is greater than perfection. There's so much mess in these stories. So much rain. So much to just not be proud of. Yet we find these stories right there in our Bibles. Because they are important to the heart of God. Because they matter. Because God is glorified in them. Because even when everything within us shouts, 'How could any fruit come from this dead water-sodden, storm-destroyed ground?' Heaven echoes with the promise that there is always a way back home. That His grace is the most powerful force in the cosmos. I am always moved by the story of Rahab. She was named Rahab the harlot. Not really the story you want to post on social media and shout from the rooftops. Not really the girl you would choose to be a pillar of godliness and faith. And yet, God chose her. The scarlet cord that saved Rahab runs right through our Bibles and calls us home through the blood of Jesus. And Rahab's faith grafted her into the people of God. Completely forgiven, completely whole, completely free. We see this in its fullness when we hit the story of Ruth. Because just as Ruth the Moabite (a people who were also not meant to be welcomed into the people of God) is embraced and restored and healed through the protection of God and the love of a man named Boaz, we realise that Boaz's mother is the very same Rahab. The harlot saved from Jericho. Who loved the God of Israel and mothered a son whose kindness is proclaimed as righteousness in the fabric of Scripture. A family that loved God with all their heart, soul, mind and strength. This family line that led to David, and that ultimately led to Jesus. You see, the scarlet cord that saved Rahab really does run right through our stories and call us home. Because the same God that saw her faith and her heart and caused such fruit to come from a once barren life, is the same God who looks at us and calls His children home. The same Jesus that did everything to be close to us. But it's the rain of our experiences that causes us to grow. It doesn't make us perfect, but it teaches us to lean on the One who is. It gives us a gentleness that we can only find at the foot of the cross. A knowledge of the debt that we have been forgiven that allows us to live openhanded in our response to those who hurt us. To live openhanded. Full stop. It is the rain that strengthens us. And a garden that comes forth. ← I’m rubbish at being ill. But God still speaks through it.